Sumatra, the western island of Indonesia, is the largest hot spot for palm oil production in the world. Over the past 35 years Sumatra has lost roughly 50% of its rainforest to deforestation for palm oil production and paper pulp. Because of this, iconic wildlife species have become critically endangered, some dangerously close to extinction. In the wake of this devastation, a local non-government organization (NGO) in Northern Sumatra known as the Orangutan Information Centre (OIC) has established multiple programs across the island to aid various forms of conservation through reforestation, community outreach and education, research and surveillance of natural rainforest habitats, wildlife rescue, and tackling forestry crimes such as illegal logging, poaching, and wildlife trafficking. The Sumatran Wildlife Sanctuary is one of the many project sites OIC manages. Located on the eastern border of the Gunung Leuser Ecosystem in northern Sumatra. In February 2017 I traveled to North Sumatra in order to get a first hand look at how the West African Oil Palm and the production of it's byproduct of palm oil has affected the landscape, people, and wildlife in the region. This experience inspired me to do as much as I can from home to help provide financial support for the conservation and wildlife rescue work taking place in Sumatra every single day. By sharing these stories in public fundraiser presentations I’ve been able to raise and donate money directly to OIC as well as spreading awareness of these issues. I plan to return in early 2020 to continue documenting the complex issues of palm oil production in Indonesia and explore more conservation efforts taking place throughout Sumatra. This one hour long presentation takes viewers into the jungles half way across the globe, providing an in-depth look at what palm oil has to do with Sumatra’s deforestation, wildlife displacement, illegal poaching + hunting, illegal pet trade, loss of natural water supply, human rights violations, human-wildlife conflict, and more. These events are ticketed fundraisers meant to educate viewers and raise donation money for the OIC. Some of the topics and imagery may be disturbing for younger audiences. Animal cruelty and poaching are important elements in the overall story in Sumatra and will be featured throughout this presentation. Interested in hosting a SOTOP event in your establishment? Contact me! Visit the News page for info on upcoming events, or follow @HiraethDiaries on Instagram to see new event announcements, photos, and stories! 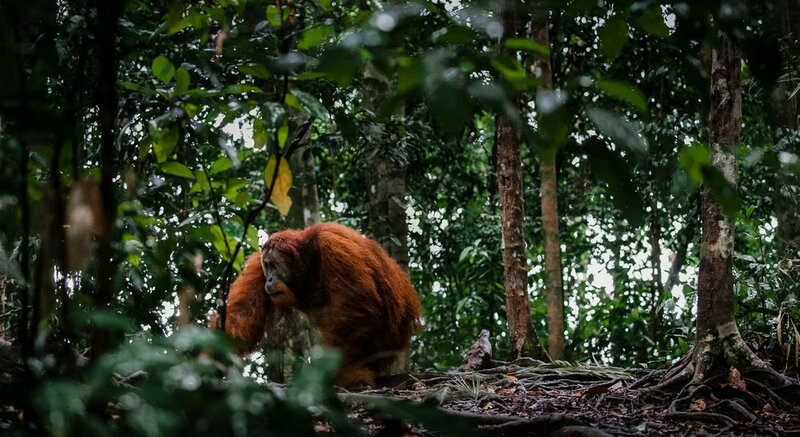 A wild, male Sumatran orangutan passes through the Gunung Leuser National Park in northern Sumatra. This park holds some of the most diverse ecosystems of the world. Orangutans are the largest tree-dweling mammals on earth, spending over 90% of their time in canopies where they sleep and eat ripe fruit, young leaves, termites, and vines. Found on the islands of Borneo and Sumatra in western Indonesia, the future of all orangutans is grim. As more and more natural rainforest is burned and cut down for paper mills and palm oil plantations, orangutan population numbers dwindle. More plantations means more roads sprawling throughout the jungle, which means easier access into and through wildlife habitat for people. These allow poachers to reach remote areas to trap and or kill wildlife such as the Sumatran elephant, orangutan, rhino, and tiger; all of which are now critically endangered, with rhino and tiger dangerously close to extinction. Chances are you unknowingly use products containing palm oil on a daily basis. What is Palm Oil used for and why? Hundreds of companies around the globe use palm oil in thousands of different products such as processed foods, beverages, hygienics, makeup, supplements, cleaning supplies, and more. Being one of the most lucrative oil crops in the world, the demand for palm oil is massive. Many companies list palm oil on ingredient labels under different names. Click below for a full list of different palm oil names. 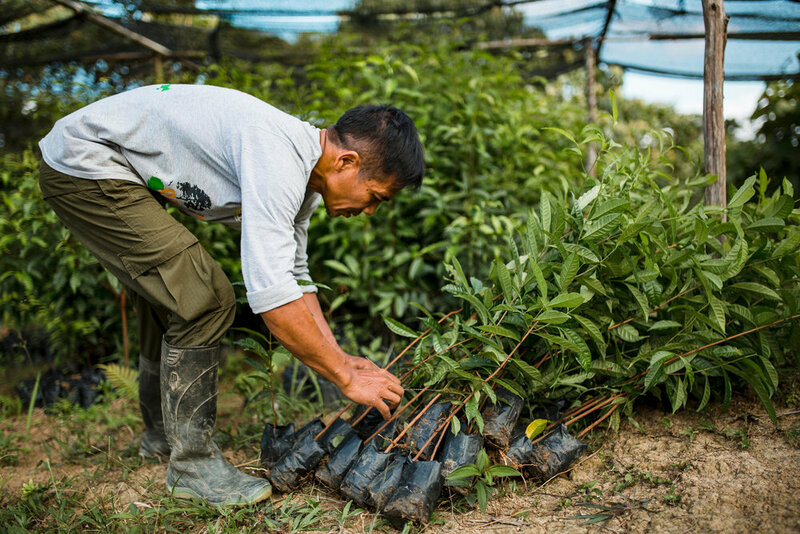 OIC staff member Bardock preps saplings for planting in a reforestation site. Donations provide OIC with the funds and tools they need to defend and preserve the jungle, plant new trees in reforestation sites, perform wildlife rescue missions, educating locals in sustainable coexistence living, and much more! With continued development, deforestation, and wildlife numbers plummeting, it's a race against time to save what's left and build hope in Sumatra. Every little bit helps! Taking advantage of a rain-free day, children practice their English skills outside of the Rumah Baca Pintar Bersama school in the village of Timbang Lawan, located just outside of the Gunung Leuser National Park. Books for Sumatra: Raising the Next Generation of Stewards of a Land in Peril. With little to no opportunity of education in rural areas in Sumatra, and in a culture where reading is not commonplace, many who grow up in rural areas end up working in oil palm plantations or turn to other, more lucrative and illegal activities such as poaching. The Rumah Baca Pintar Bersama school located in the small village of Timbang Lawan offers children in and around the village the chance of a brighter future. 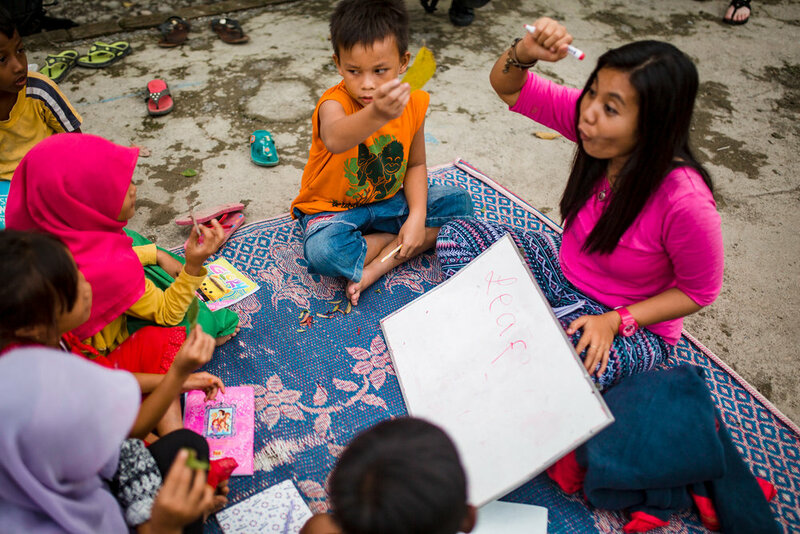 Nayla, one of the OIC staff members, helps operate the school and teach the students and promotes reading as a method of improving their English and reading skills as well as a way to empower and inspire them. To do so, Nayla and the rest of the volunteer staff at this learning centre have created a small collection of books for the kids to explore, but with a lack of libraries or book stores in Sumatra, they are difficult to come by. Many of their books are in poor condition and hardly any are in English. Because of this, the Hiraeth Diaries Give Back program has been collecting an array of both fiction and non-fiction books to donate to the school. Now we just need to send them! Due to the sometimes-unreliable mailing services in Indonesia, the plan is to ship the books in multiple packages to reduce the risk of losing all of the books in one parcel. The cost of shipping is high, so small fundraisers have been held to raise money in order to send these packages, but more funds are needed, and in time, more and more books will be collected and shipped. Would you like to help empower and inspire the next generation of stewards in Sumatra? Contact us to find out how! The school resides on the land of a local rice farmer who donated a small building for the learning centre to grow. 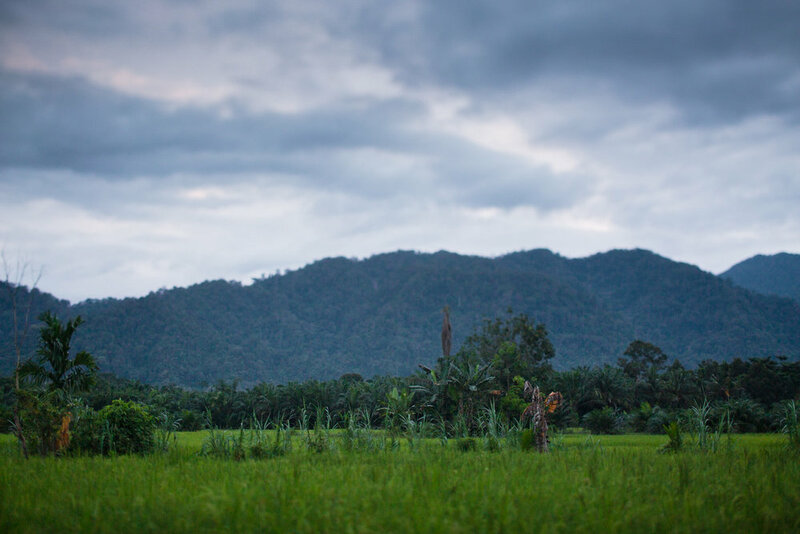 The rice paddies once bordered a natural rainforest buffer zone between his property and the Gunung Leuser ecosystem. Today, oil palm plantations can be seen on his borders, a common sight in today’s Sumatra.